On this Anzac Day, it is timely to highlight the exhibition Pe-ac-ed with Love - Story Quilts by War Veteran Families that will be on display at the Sydney Quilt Show in June. Maree Gebhardt received a $3000 Guild Scholarship in October 2005 and used this funding to coordinate the Partners of Veterans Association quilt exhibition United in Love We Create Peace that was held in Canberra in August 2006. Family members of war veterans were invited to "record their life journeys in textiles through the design and creation of individual quilts and an accompanying written story." Forty seven quilts were featured in the exhibition. 90% of the participants had never made a quilt before and 50% had no sewing experience. Expertise Events have selected this exhibition, renamed Pe-ac-ed with Love, to be a major touring exhibition for 2007. Maree Gebhardt and Margaret Rehorn, National Project Coordinator from the PVA, urge all Australians to see these historical quilts and consider the trans-generational cost of war to veterans, their families and the wider community. Peaced at last is a play on words indicative of the peace I have found at the end of my long journey as a daughter affected by the Vietnam War. The tree is symbolic of my life. When I was sixteen my father left home and that broke my heart. The tree branches off in different directions - one going straight up showing how I believed my father's life was heading; the other is my life veering violently sideways, losing direction. 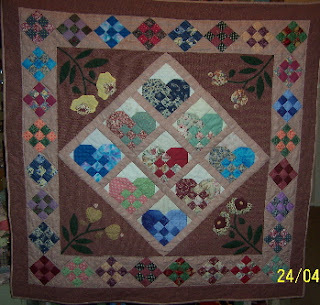 Eastwood Patchwork Quilters will be having their 2007 Quilt Exhibition on the first weekend in May. Over 100 quilts will be on display together with a craft stall and quilt shops. Morning and afternoon tea with light luncheon available. Don't forget Friday showcase starts at 10am at the Guild office - be early to get a seat at this ever popular guild event! Acceptance letters for the Sydney Quilt Show 2007 will be posted out to entrants at the beginning of May. We received over 370 complying entries and ALL have been accepted. If you are one of our entrants, you will need a suitable bag for carrying your quilt(s) to your Drop Off Lady. For smaller quilts, a pillow case will do the trick but, for larger quilts, you will need something more roomy. You will find a pattern for a simple quilt bag here (scroll to the bottom of the page). Don't leave it until the last minute or you may find yourself going to pieces - arrgh! Don't forget that all of the Going to Pieces challenge quilts will be on display at the Sydney Quilt Show 2007. The "Away Meeting" in 2007 will be at the Tumbarumba Golf Club in southern New South Wales this Saturday afternoon, 14 April 2007. 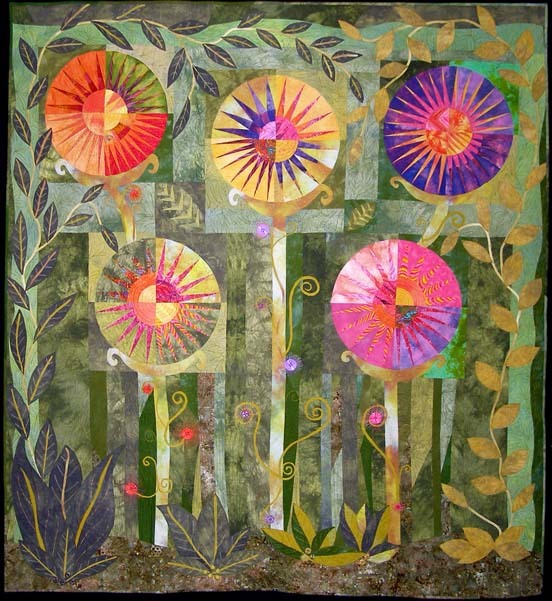 Reknown applique artist, Val Moore, is the guest speaker and all members are welcome to attend. Sydney members travelling to Tumbarumba by coach will take in many attractions en route including visits with Gundagai Quilters and Adelong Quilters and an excursion to the Pioneer Women's Hut - home of the National Quilt Register. Meanwhile, if you are heading off to the Sydney Royal Easter Show at Homebush this week, please sure to say hello to the Guild team that is demonstrating patchwork and quilting near the craft displays. Are you looking for a highly specialised advertising print medium to promote your quilting business and associated quilting services? Each year in preparation for the largest quilt show in the southern Hemisphere, The Quilters Guild of NSW Inc, currently celebrating its 25th Year, offers exclusive advertising in its highly sought after Sydney Quilt Show catalogue. Covering all aspects and information of the Sydney Quilt Show, this publication is certainly the way to go! You can feature your new business, special show items or if you are a current Template supporter, add extra punch to your profile by extending your presence in the market through this special publication. New advertisers, who wish to take advantage of the 20% discount for four consecutive advertisements in the Template, can have their first advertisement diverted to the Sydney Quilt Show catalogue with the three remaining advertisements appearing in the next three issues of the Template. Advertising rates start from $82.50 for an eighth of a page ad, with discounts for ads running over four consecutive issues - see our advertising brochure for more details. For your ‘no-obligation’ advertising quote or any further information, contact the Guild's Publicity Officer, Alan R Tremain before the advertising closing date, Friday 27th April 2007. A fun and interesting collection of quilts and other items by local quilters and friends. Some items will be for sale.